The show celebrates the 100th anniversary of the ballet ‘Parade’, premiered in 1917 by sergei diaghilev’s ballets Russes at the Théâtre du châtelet in Paris. This 20th century masterpiece features the music of erik satie scored to a one-act scenario by Jean cocteau with costumes and sets designed by Pablo Picasso. This new version of ‘Parade’ revisits the ballet on an interdisciplinary platform, embellishing the choreography with stop-motion animation, puppetry and projection dancing. The performance includes other works by satie, known by his contemporaries as ‘the velvet gentleman’. The programme includes some of his masterpieces for the piano such as Gymnopédies and Gnossiennes as well as works pre guring the minimalism of steve reich and the incidental music of John cage. Il-wirja tiċċelebra l-mitt anniversarju minn meta l-ballett ‘Parade’ intwera għall-ewwel darba -1917 mill-ballets Russes ta’ Sergei Diaghilev t-théâtre du Châtelet f’Pariġi. Dan hu kapolavur tas-seklu għoxrin b’mużika ta’ erik satie għax-xenarju b’att wieħed ta’ Jean Cocteau u b’kostumi u sett ta’ Pablo Picasso. 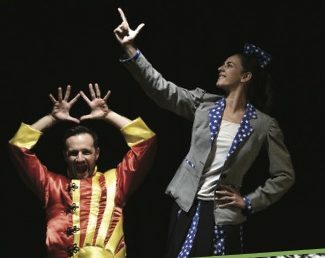 Din il-verżjoni ġdida tal-ballett ‘Parade’, bi pjattaforma interdixxiplinari, issebbaħ il-koreogra ja b’animazzjoni stop motion, pupazzi u projezzjoni ta’ żfin. Il-wirja tinkludi xogħlijiet oħra ta’ satie, magħruf minn dawk ta’ żmienu bħala “il-ġentlom tal-bellus”. Il-programm jinkludi wkoll xi wħud mill-kapolavuri oħra tiegħu għall-pjanu bħal Gymnopédies u Gnossiennes kif ukoll xogħlijiet li aktar tard wasslu għall-minimaliżmu ta’ steve Reich u l-mużika inċidentali ta’ John Cage.